Spacecraft by national space agencies to study greenhouse gases, like NASA's OCO-2, are being joined by satellites proposed by companies, non-profit organizations and even the state of California. 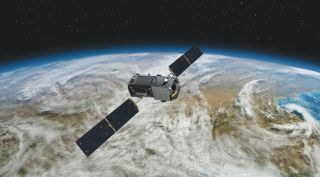 BREMEN, Germany — As a growing number of organizations propose satellites to monitor greenhouse gases, national space agencies who already operate such spacecraft welcome those new entrants — as long as they're willing to share their results. One company, Montreal-based GHGSat, announced Sept. 24 it has raised $10 million in what it called a "Series A2" funding round. The funding, the company said, will expand its commercialization efforts and fund an additional satellite. The company launched one satellite in 2016 and plans to launch two more next year. The funding, GHGSat Chief Executive Stéphane Germain said in a statement, "also secures access to some of the largest customers in the world for our services. We're very excited for this next stage of our growth." The funding round for GHGSat came 10 days after California Gov. Jerry Brown announced the state would develop and launch its own satellite to track greenhouse gases. "This groundbreaking initiative will help governments, businesses and landowners pinpoint – and stop – destructive emissions with unprecedented precision, on a scale that's never been done before," he said in remarks at the Global Climate Action Summit in San Francisco Sept. 14. The satellite will be developed by San Francisco-based Planet in collaboration with the state government "and others," Brown's office said in a statement. Neither the governor nor the company disclosed additional details about the proposed satellite, including its cost, funding source or schedule. "These satellite technologies are part of a new era of environmental innovation that is supercharging our ability to solve problems," said Fred Krupp, president of the EDF, in the governor's statement. "They won't cut emissions by themselves, but they will make invisible pollution visible and generate the transparent, actionable, data we need to protect our health, our environment and our economies." "The key here is free and open exchange of data," said Mike Freilich, director of NASA's Earth science division, during a panel discussion Oct. 4 during the 69th International Astronautical Congress here. "More accurate, well-characterized measurements provide better authoritative information if they can be combined." He welcomes the rise of non-traditional players developing such systems, provided they were open about sharing their data and how it was calibrated. "If we have free and open exchange of data, and insight into the calibration and validation and characterization, all comers, from the commercial sector, from sub-national organizations, from NGOs, et cetera, can only help to advance the science." However, neither NASA nor other national space agencies are turning over the efforts to track greenhouse gases to other organizations. During the panel, Freilich highlighted the results from NASA's Orbiting Carbon Observatory (OCO) 2 spacecraft, which monitors natural processes that regulate carbon dioxide levels in the atmosphere. "We are seeing the Earth breathe," he said. Installing OCO-3 on the ISS, which is in a 51-degree orbit rather than the sun-synchronous orbit most Earth science satellites fly in, will provide a new perspective on carbon dioxide changes. While such satellites pass over locations at the same time each day, OCO-3 will see locations at different times of day and night. "OCO-3 measurements, over time, will allow us to resolve issues of the diurnal cycle of CO2 in the atmosphere," he said. The Japanese space agency JAXA is preparing for the launch of the Greenhouse gases Observing Satellite 2, or GOSAT-2, which is designed to measure carbon dioxide and methane gases at far higher precision than its predecessor, GOSAT. GOSAT-2 is scheduled for launch on an H-2A rocket on Oct. 29, said Naoto Matsuura, senior chief officer of satellite applications and director of JAXA's Earth Observation Research Center, on the panel. Matsuura added JAXA is starting work on another satellite, GOSAT-3, in 2020. "We have started to contract for its development," he said. Josef Aschbacher, director of Earth observation programs at the European Space Agency, said the Sentinel-5P spacecraft launched a year ago is providing "extremely good daily measurements" of greenhouse gases. That will be followed by the Sentinel-4 and -5 missions, which will be carried on weather satellites operated by Eumetsat. He added that ESA is considering a future Sentinel mission dedicated to carbon dioxide monitoring. Others on the panel echoed Freilich's statement about the need for more data. "Greenhouse gas measurements are very, very difficult, and no single country can make all the necessary measurements alone," said Harry Cikanek, director of NOAA's Center for Satellite Applications and Research. "It takes a whole group effort."